Presenting is one of those few arts which seem simple in theory, but in practice can prove daunting enough to reduce even the calmest person in the room to a bundle of nerves. At KPMS Commercial, we’re proud to supply a huge variety of presentation tools, from interactive whiteboards to projectors, alongside lecterns like the Presentation 05 model. These tools are used in everything from schools to conference halls, but whilst they certainly help you get your point across, they’re no cure for nerves. Getting off on the right foot is absolutely essential when you’re making a presentation, so don’t waste time sorting out your notes and papers when you get on to the stage – make sure you do it ahead of time. Another top tip is to avoid stapling together any notes you’re taking on stage. When stapled, turning over a page becomes a noisy and distracting business, one which firmly takes away from your presentation. Instead, take your papers to the stage and slide your notes across when they’re done – simple and silent. By preparing the lectern, you’ll be able to confidently walk to the stage and begin speaking, confident that your notes are exactly where you’ve left them. When presenting at a lectern, keep in mind that the lectern isn’t there to keep you upright, it’s there to hold your notes and give you the freedom to move comfortably. As such, don’t lean on, grab or hit the lectern when you’re speaking. Nerves often get the better of us but when gripping on to, or otherwise unnecessarily interacting with, your lectern you cut a panicked shape. You may find it helps to stand a little further back from the lectern. 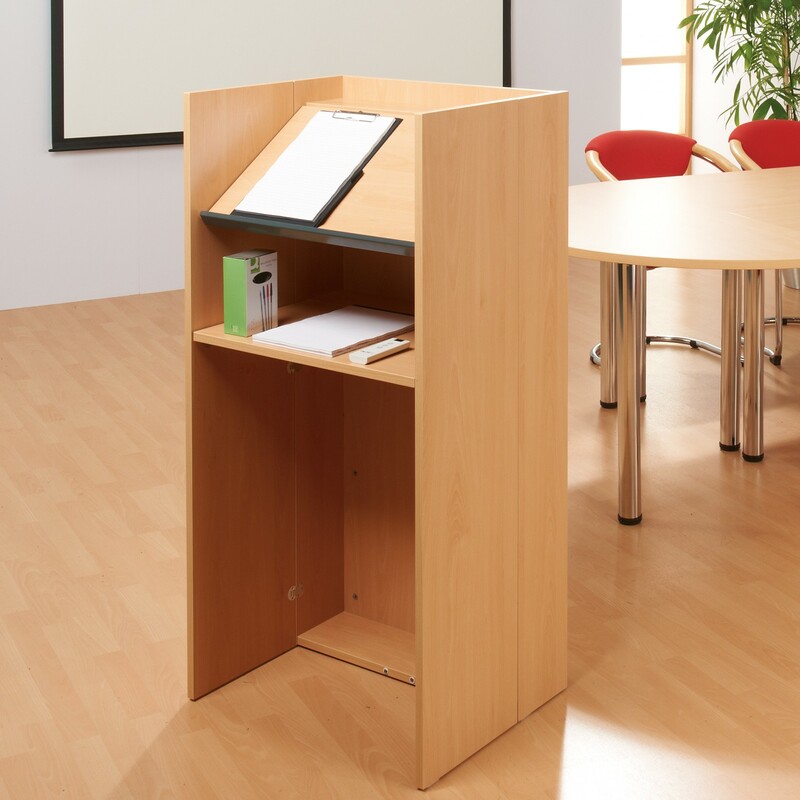 Your lectern is in place to give the stage a focal point for the speakers and to give them somewhere to place their notes. All too often, people feel as though they have to stand rigidly behind the lectern when they speak. Good public speaking practices dictate that the more mobile and expressive you are during your speech, the livelier and interested the crowd become, and the more effective your points come across. That’s why we always recommend you leave the lectern just as soon as you feel comfortable on stage. It might sound odd, but if you’re delivering a high impact speech, don’t destroy the moment by fumbling around with papers for a few minutes before you leave. Conclude your speech, accept the applause and make your way off the stage. You can always return after the meeting to get your papers, or have the emcee hand them to you when they retake the stage.